The picture alongside this article is: Against a blue background, in the middle of a loop of film, titles: Movies For the Blind – great films, screen optional. We are happy to share with everyone a wonderful website for all moviegoers. 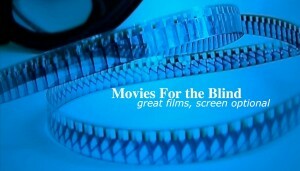 Movies for the blind, with thanks to their host Internet Archive have created an MFTB collection! Browse all the episodes and search with all sorts of categories and topics to listen to audio described movies. Yet another reason to support IA and their incessant efforts to upload the public domain and free access to information. There are 2 links below, the first will take you to their archive listings and the second to movies for the blind website.